And so it begins… the holiday season! This October marks the beginning of homeowners’ decorative showcases both inside and outside of their houses. After the 4th of July, many front yards and picture windows seem plain and bare, unless there’s a happy sunflower decal on the window or a few colorful flower bushes on the lawn. So after three months of decoration-less landscaping, October arrives, and people start erecting frightening ghouls, ghastly gravestones and spooky spider webs. They begin with Halloween, move on to Thanksgiving and then the winter festivities come right around the corner! Follow that up with Valentine’s Day and a few other holidays and people are almost celebrating Independence Day again! This year, and beyond, forget about buying disposable holiday decor at a home depot store, a grocery store or an outlet mall. Why not try some more environmentally responsible alternatives that keep our planet healthier? Buy Owner will help you make greener choices when decorating and entertaining during the holidays, starting here with a green Halloween! Use live greenery as part of your outdoor decorations! Planting colorful flowers is a sure-fire way to spice up outdoor Halloween decorations! Pick a universal color that can be used for mostly all holidays: white, red or black. Red impatients blossom into full, flourishing mounds! In a colder climate, they can bloom as early as spring and last as late as mid-November. Any white flower will add some delicacy to the decor. The following black flowers will help create a ghoulish garden: Black Diamond tulips, Black Barlow columbines and Alcea Rosea Nigra hollycocks. Once you have chosen the universal color, place potted plants around your flower beds. For Halloween, go to any nursery and pick up orange chrysanthemums, red-orange heleniums (sneezeweeds), yellow helianthus (perennial sunflowers) or blonde goldenrods! All kinds of fruits and vegetables make the most appealing, appetizing centerpieces. Place a large bowl in the center of the table. For fall, look to fill it fruits that boast brown, orange, red or yellow hues: oranges, pears, pineapples, pomegranates, bananas and kiwi. Green veggies (like asparagus, broccoli and green beans) also enhance the warm, rich tones of the fruit. 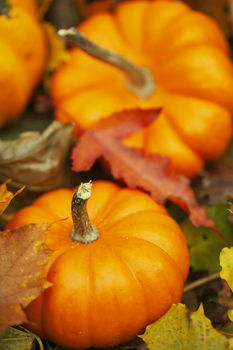 You may even want to decorate with pumpkins! Nothing says Halloween like a spooky Jack-o-lantern. Take the leftovers and whip up some tasty pumpkin pie. You could even save the seeds and plant pumpkins! Paper napkins that feature candy corn and pumpkins offer style and convenience, yet they waste resources. Try a greener, lasting linen that is washable and reusable. Visit Rawganique for some burgundy, russet orange or ivory organic hemp napkins. The GreenSage Store offers color-grown organic cotton tablecloths! You may want to use plain white linens and dress them up with colorful, reusable ribbons that match each holiday! Check back in November for tips on how to have a greener Thanksgiving! » How Much is a View Worth?